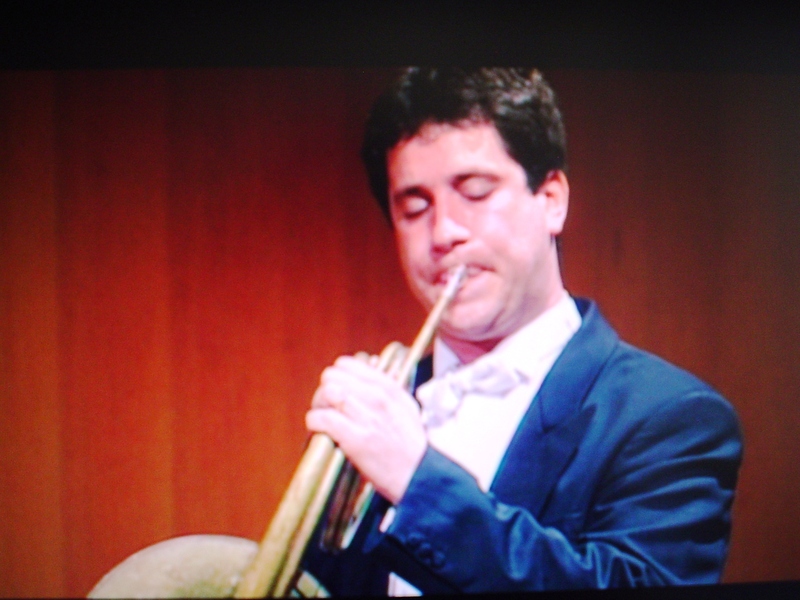 Along with audio recordings, DVDs make great learning tools for horn players. They provide the audio quality of CDs, but with several advantages. With DVD recordings, students and teachers can observe embouchure, equipment, posture, stage presence, placement for the soloist, and many other important components of horn performance. In this two-part series, I’ll share my “short list” of recommended DVDs. Most are fairly easy to order through online retailers, usually at very reasonable prices. I’ll apologize in advance for the quality of the screenshots; they were taken with a digital camera. It’s probably a good thing, but my screen capture software doesn’t work on commercial DVDs. This historical recording has been recently re-released on DVD by Hans Pizka Edition, and is available in the U.S. from Pope Instrument Repair. 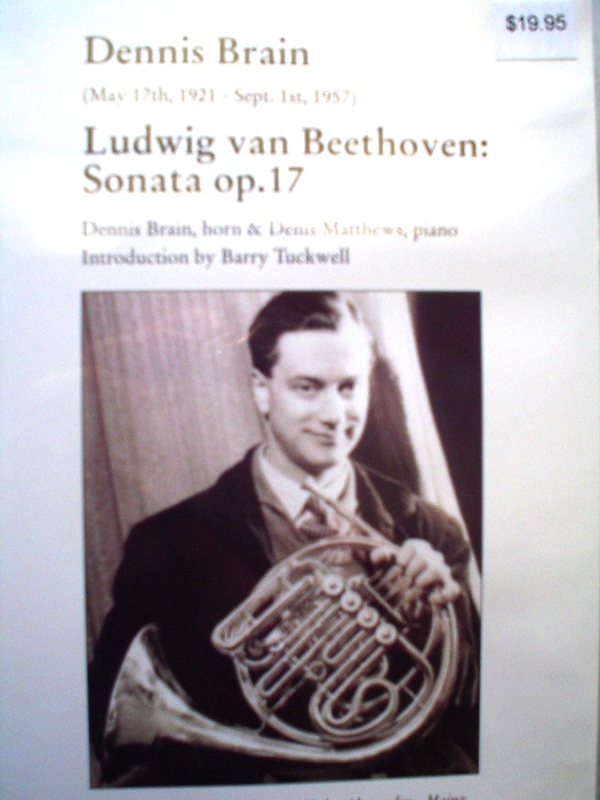 In addition to the rare video footage of Dennis Brain, the DVD includes lots of extra content, including an introduction by Barry Tuckwell, and several “bonus” chapters with pictures, information, and a performance of the Weber Concertino by Hans Pizka. Highly recommended! Clips of the video are also available on YouTube, and the footage of Dennis Brain (minus the extra content) can be downloaded for a small fee here. This fabulous set of DVDs has a number of important performances for horn players, and is available for a great price on Amazon. Disc 1 contains all 6 of J.S. 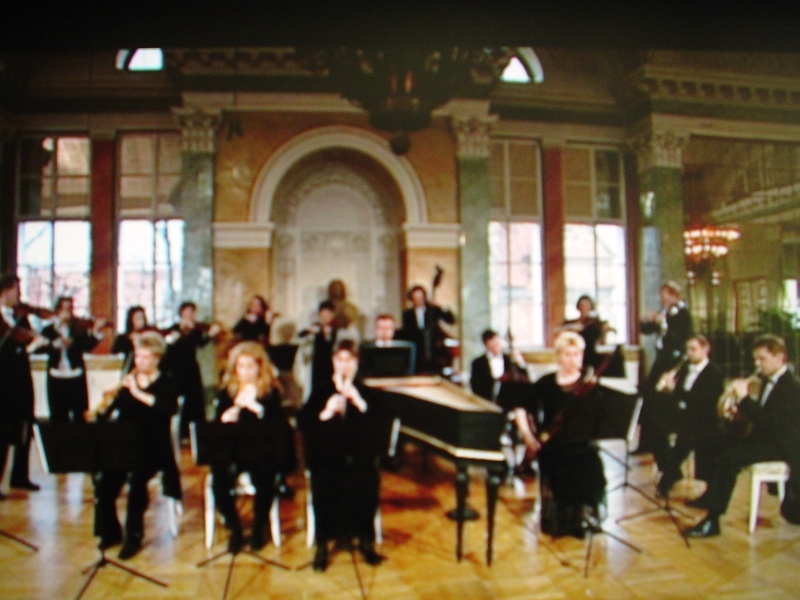 Bach’s Brandenburg Concertos, performed on period instruments by the Freiburg Baroque Orchestra (see screen image above). For brass players, the 1st and 2nd concertos are of course especially important because of their significant horn and trumpet parts. Disc 2 contains a complete performance of the Mass in B minor, BWV 232, with the Leipzig Gewandhaus Orchestra and Georg Chrisoph Biller conducting. The famous “Quonium” movement for solo bass and obbligato horn is performed here by (I’m assuming) a trumpet player on a corno da caccia. 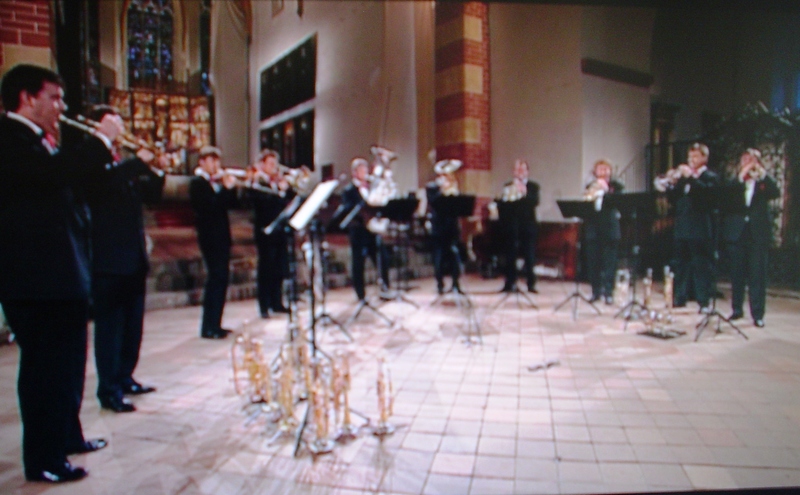 Disc 5 features the German Brass in an all Bach program recorded at the Thomaskirche (one of Bach’s churches) in Leipzig. If you haven’t heard this group (see image above), you need to! The playing is incredible, and the transcriptions are all first rate. They have a number of CD recordings, but I particularly like this DVD because you can observe all of the instruments they use during the program. 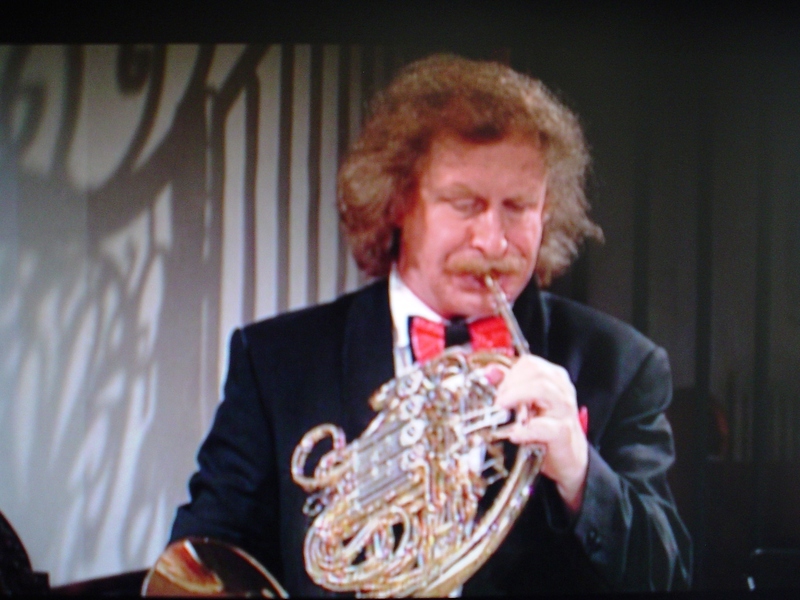 Check out the close up shot of horn player Wolfgang Gaag and his triple horn on the bottom. This DVD contains some amazing performances, most notably Robert Schumann’s Konzertstück, op. 86 for four horns and orchestra. The soloists are Stefan Dohr, Dale Clevenger, Ignacio Garcia, and Georg Schreckenberger. The rest of the program includes Beethoven’s Symphony No. 8, Franz Listz’s “Les Preludes,” and Wagner’s “Ride of the Valkyries.” This DVD is pretty difficult to find in the U.S. but if you know someone who can order it for you from Amazon.uk, the shipping costs are definitely worth it. If this isn’t a possibility, there are several clips from the DVD posted on YouTube. Stefan Dohr, Principal Horn of the Berlin Philharmonic, dazzles again in this live recording of Britten’s Serenade for Tenor, Horn and Strings (Philip Langridge, tenor). 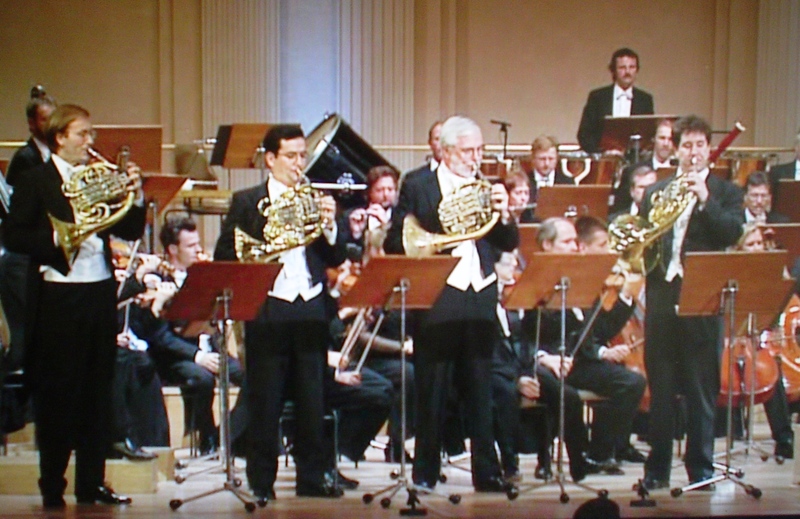 In the image above, Dohr is playing the “Prologue” on a natural horn. Check out Amazon for this DVD, as they have it for a great price. Another great recording by a world class soloist. Although the recording is a few years old (check out the dress), the playing is impeccable. Other works on this all Strauss DVD include the Capriccio for String Sextet, Romance for Clarinet and Orchestra, and Le Bourgeois Gentilhomme Suite. Although the new price on Amazon is a little high, look for used copies to get a better price.